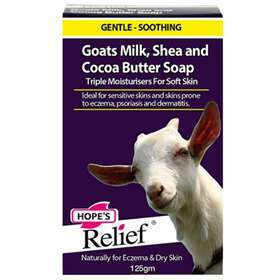 Hope's Relief Shea, Cocoa Butter & Goat's Milk Soap is a lather-rich body bar made from three organic moisturising ingredients- Shea Butter, Cocoa Butter and 100% Fresh Goats Milk. While deeply moisturising, Hope's Relief goat milk soap gently cleanses and hydrates to leave skin feeling hydrated, smooth, soothed and nourished. Free from harsh, skin-irritating ingredients it is kind to all skin, from babies to mature adults. Suitable for sensitive skin and those prone to dry skin conditions like eczema, psoriasis, and dermatitis. Moisturises, and Relieves dry, itchy skin. Leaves skin clean, soft and hydrated. Ideal for skin prone to eczema, psoriasis, dermatitis and acne. Free from: artificial colours & fragrance, petro-chemicals, propylene glycol, sodium laurel sulphate, parabens. Gently massage into your skin and rinse clean. Pat yourself dry and for ultimate in natural hydration apply Hope's Relief Moisturising Lotion. If any discomfort occurs discontinue use. Sodium Palmate (Sustainable Palm Oil), Sodium Cocoate (Coconut Oil), Aqua (Purified Water), Fresh Goat's Milk, Glycerin, Sodium Chloride, Geranium Essential Oil, Organic Shea Butter, Organic Cocoa Butter, Tocopheryl Acetate (Vitamin E), Edta.